A Durant man is in a dispute with his landlord over whether he should have to pay for costly repairs. The landlord says he was trying to help out his tenant, John Paul Densmore, when he leased him the home in July for $300 per month. The landlord says that’s half the market value. “This is the bathtub with the toilet draining into the bathtub,” Densmore’s son said in cell phone video recorded Sunday. It’s difficult for him to watch but the smell is even harder to put into words. Sunday, Densmore says plumbing began bubbling up from the toilet into the bathtub of the Durant home he rents. 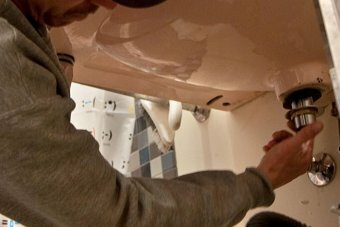 He says he waited three days for the landlord to hire a plumber but ended up paying $131 to have it fixed himself. “This was his to fix, not ours,” Densmore said. Densmore showed us roots that were pulled out of the piping. “It stinks real bad,” he said. It’s part of the reason he says he was told the entire system needs to be replaced. It would cost thousands of dollars and Densmore says his landlord expected him to pay. “He told me either you can have the system replaced or you can move,” he said. True to his word, Densmore received a letter Thursday notifying him the eviction process was underway. A copy of an unsigned lease was included with the letter, an agreement Densmore disputes signing. The landlord didn’t want to speak on-camera but he provided us with a signed version of the lease. Which side holds more water remains to be seen. Densmore says he plans to file a complaint with the Metropolitan Fair Housing Council. A eviction hearing is scheduled in Durant for Friday, March 20.